A 58-year-old Perth woman locked herself to a drilling device in an effort to prevent the construction of the Roe 8 Highway from making progress. Elizabeth Burrow is one of many protesters opposing the construction of a new toll road due to the danger it presents to the Beeliar Wetlands and Coolbellup Woodlands. Protesters also believe it’s a waste of money, given that the state government is in debt. “I am opposed to the government wasting nearly two billion dollars of taxpayer money on a toll road, in the process destroying our remnant wetlands and negatively impacting on the community," Burrow said in a statement. 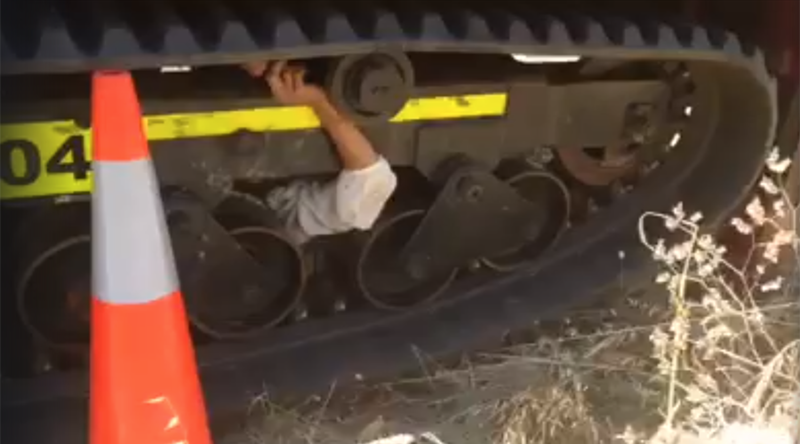 The Wetland Defenders uploaded a video to their Facebook page showing the 58-year-old wedged under the machine. Burrow took action to prevent workers from drilling for soil samples of the woodlands and wetlands before construction begins. The ‘Save Beeliar Wetlands’ group lost an injunction against the works on Monday. While the Federal Court agreed there was a case to be heard, the injunction request was not successful. The government had argued that the delay would be too expensive. In the video, Burrow lies calmly inside the drilling machine as fellow protesters and construction workers watch. "Sorry to muck up your days guys, but we just feel pretty passionate about the environment and the destruction and this is all we can do," she said. “The good news it you still get paid,” she told the construction workers. While the Wetland Defenders said police at the scene were “very supportive,” some commenters expressed concern for Burrow’s wellbeing. “She has a mattress and water and food and is shaded under the machine with someone next to her in support,” the Wetland Defenders explained. Roe 8 is part of the Perth Freight Link project in Western Australia which aims to extend Roe Highway west of the Kwinana Freeway to Stock Road in Coolbelup, and eventually link it to Fremantle Port. The government says it will take thousands of trucks off Leach Highway and surrounding roads everyday. Protesters argue that the road will cause irreversible damage to the wetlands and destroy the habitat of endangered animals like the Carnaby’s black cockatoo. The opposition Labor Party has promised to scrap the plans should they be elected in state elections in March, with leader Mark McGowan announcing he would allocate the funds to other transport projects. McGowan said he would re-negotiate the Roe 8 contract and told construction workers to minimise any costs between now and then. In response, the Federal Government said funds could not be reallocated and that it would pull $1.2 billion of funding slated for the highway if it were to be stopped. Burrow’s protest is the latest in a number of actions taken by protesters to prevent the road going ahead. In December, two women chained themselves to the gates of WA Limestone in Bibra Lake to prevent the machinery being moved. Also in December, a man chained himself to construction machinery in Coolbelup in southern Perth. Police cut him free and arrested a number of protesters. WA Today reports more than 25 people have been arrested following efforts to delay construction.